The compact C40 benchtop autoclave from Priorclave gives start-up laboratories the opportunity to acquire a feature packed steam steriliser at an affordable price and supported by an extended warranty to give long-term peace of mind in terms of performance and reliability to protect that initial low-cost investment. The C40 is a frontloading 40l capacity autoclave with a 350mm diameter chamber and is designed specifically for placing on a benchtop. A key feature of the Priorclave is its small footprint which enables even the smallest laboratory to own a highly efficient machine. Designed and built by Priorclave at its UK manufacturing centre this versatile range is produced in two formats, as a standard operating autoclave or with a highly efficient vacuum system adding further to its appeal for laboratories where infrequent sterilisations take place or a more demanding medium requires faster processing. 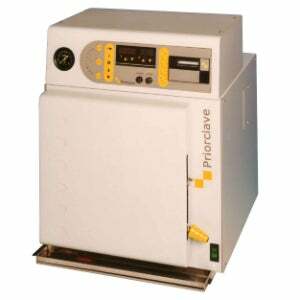 Everything about Priorclave C40 autoclaves is designed to appeal to those wanting a simple to operate machine. Out of the box the C40 benchtop autoclave requires only plugging into a 230V, single-phase supply and all operational functions are governed by the established, simple to programme and totally reliable TACTROL®2 microprocessor system – just set the temperature and time required, select any options needed and press start, operation is fully automatic once the cycle has started. TACTROL®2 provides easy pushbutton control, whether requiring simple cycles ora fully featured multi-programme operation. By fully automating the sterilising process and with features to assist with autoclave managementTACTROL®2 allowslaboratory staff to continue with other tasks secure in the knowledge that autoclaving is proceeding safely and efficiently. Buy Priorclave autoclaves in the knowledge that every care has been taken to build robust machines with a superior exterior finish to body panels and frames preventing potential for cross-contamination within laboratories. During manufacture Priorclave has incorporated Biomaster Protection into the exterior epoxy coating, a highly effective and permanent treatment for control of harmful bacteria, making any surface cleaner, more hygienic and providing durable lifelong protection against the threat of cross contamination. As with all Priorclaves the C40 benchtop range of autoclave enjoys the full support of a dedicated service team. At the end of the initial warranty period Priorclave is able to maintain full autoclave functionality, reliability and performance through Planned Maintenance Programmes. These are designed to ensure the longevity of the original purchase, helping reduce the overall cost of ownership. For UK based customers an optional two-year warranty, including installation, preventative maintenance servicing and any repairs for the first two years of ownership, all included in one advantageous price is available. This should particularly appeal to start-up laboratories and those with low-volume sterilising throughput where investment in that initial purchase needs to be protected.